Hi there! I hope you had a wonderful week last week and truly felt appreciated! 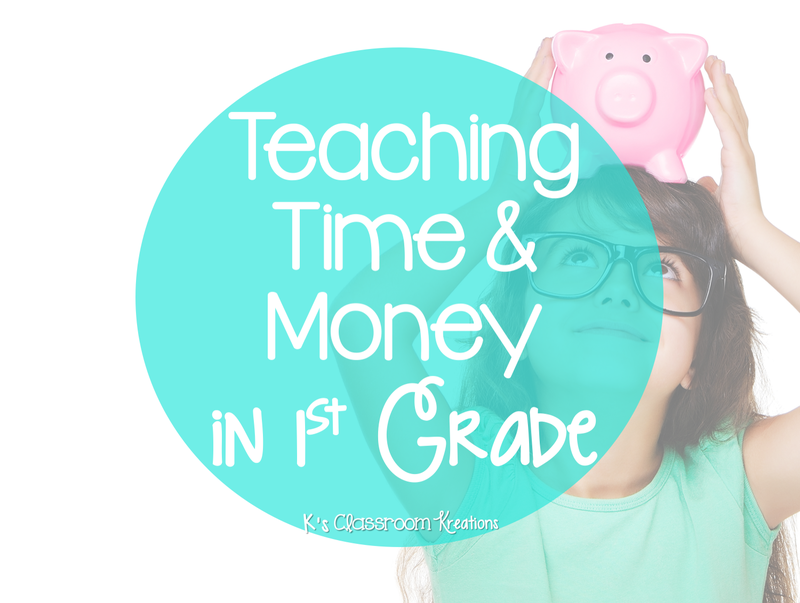 This month we are going to share some fun ways to teach time or money during our Math Tip Monday Link up. My school district (and the 1st grade Common Core Standards) doesn't place a huge emphasis on learning about money. While I still think it is important to teach, my focus today is going to be on teaching time. First, like always we start with our "Who Cares About Time" discussion and anchor chart. We brainstorm why knowing how to tell time is important and which professions find it especially important. For example, time is very important in baking (setting a timer so food doesn't burn), sports (certain amount of minutes per game/time-outs), and at airports (making sure planes come and go without accidents). Of course there are tons of other real world examples! Once we set the stage for learning I make sure my students have a handle of the vocabulary (day, night, clock, analog, digital, face, hand, etc.). We spend a day or two thinking about the order of events in a day and what we do during morning or night. We then move on to the concept of seconds, minutes, and hours. 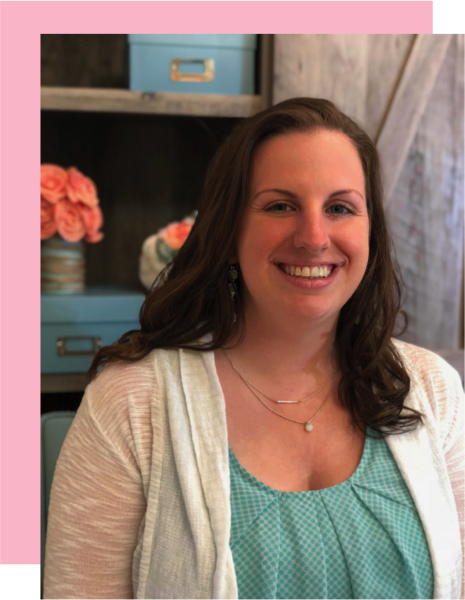 To show the difference between seconds and minutes I have my kids jump up and down for a minute, see how many letters they can write in a minute, how far they can run, and more. I also make a conscious effort to point out as the hours pass and review what we accomplished in that span of time. As adults we often say "wait one minute" which really turns into 5 or 10 and gives children unrealistic expectations of time. Once we have the basics down, it's time to introduce the clocks! I like making paper plate clocks with my students so they each have one. Simply use a brad fastener to attach hands on the plate and write in the numbers. I make sure we have practice reading the times I show (to the hour and half hour), writing the time in digital form, and having them manipulate the clock hands to show a specific time. Telling time to the hour comes very easily. Time to the half hour however is a whole different story! To determine which hour it is when the hand is between two numbers I have my kids get in the practice of starting their finger on 12 and racing it around the numbers until they get to the hand. They can see that they passed one number and didn't quite get to the next. I also incorporate movement when displaying times. Whenever they share the time the point their arms up in the air if it's an o'clock and crouch down the the ground if its _:30. 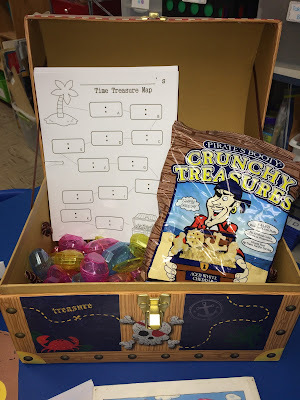 Once I've taught it for awhile we do lots of telling time math centers and matching. 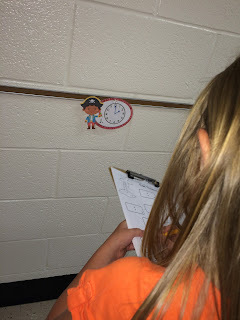 One of our favorite activities is a whole grade level scavenger hunt. 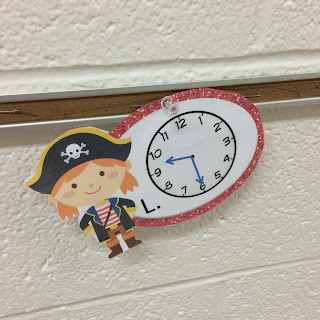 I used my Pirate Telling Time activity but any clock cards can be used. We hang clock cards around the hallways and give each student a clipboard. They search the area and record all times. Of course there's a prize for everyone! The treasure chest came from a craft store along with gem shaped Easter eggs I found earlier in the year. I hope you had a great "time" learning a few new tips! Check out the other posts below for even more fabulous ideas! Thanks for visiting my blog! I don't see any of the others visiting or commenting. Am I doing something wrong? Just want to tell you that I really like your introductory activities for teaching about time. The anchor chart really gives purpose to the concept that young children can grasp.